Healthy non-dairy muffins packed with carrots and topped with coconut whipped cream. Spring is in the air (at least, here in Austin it is), and I’ve been getting non-stop carrots in my Farmhouse Delivery box. Which means one thing to us… carrot cake. This time, in muffin form. 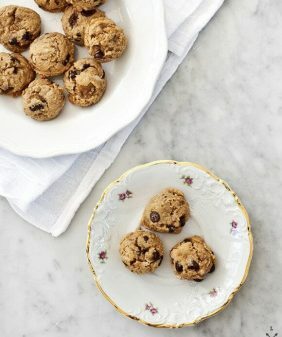 I topped these with coconut whip lightly sweetened with maple syrup. It’s airy, yet creamy… much less indulgent than a more traditional cream cheese frosting, but it was exactly what I was in the mood for this time. With a dusting of cinnamon on top. Preheat oven to 350 degrees and grease a muffin tin. Place carrots in food processor and pulse a few times until they are grated. Add in the egg, sugar, applesauce, vanilla and coconut oil and blend until combined. In a separate bowl, sift & mix together together all dry ingredients (flours, baking powder, baking soda, cinnamon and salt). Pour wet ingredients into the dry and gently fold together. Don't over mix. Scoop batter into the greased muffin tin - approx ⅓ cup batter per muffin. Bake for 15-18 minutes, use a toothpick to check for doneness. Don't over bake. Make the coconut whip by carefully opening the coconut milk can and scooping off the thick solidified part on the top. Don't move or shake the can too much, it's important that the solid and liquid parts stay separate. (save the liquid part for another use). Whisk the solid part vigorously by hand (or in a mixer). Add maple syrup or powdered sugar to make it as sweet as you like. Spoon a dollop on each muffin and sprinkle with a dusting of cinnamon. It’s felt like spring is in the air here too and it’s definitely worth celebrating. These muffins look like the perfect way to do just that. 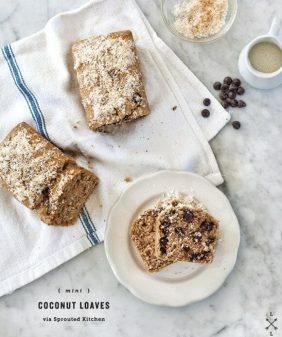 ahhh, these look so cute and I love the coconut whip recipe…must try soon! Spring was in NYC for about 24 hours and now totally gone, but I still would like to make these muffins. Love the idea of a coconut cream icing! Y. These look delicious and I can’t eat apples. Can I just double the coconut oil? Yay! 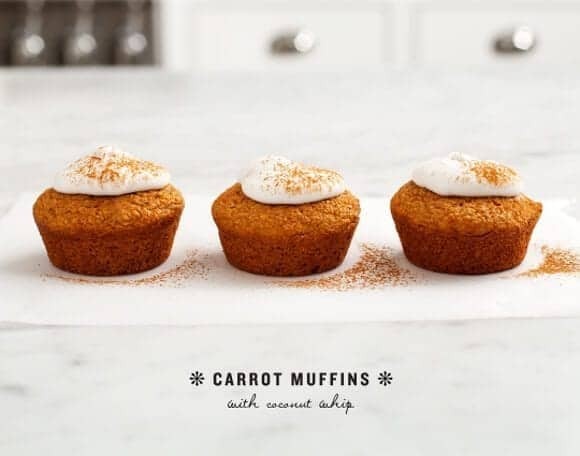 I have been looking for a carrot muffin recipe that wasn’t super-duper sweet or too heavy handed with all-spice and cloves and such. This may be it! Looks delicious as always! And its great to have a healthy spin on a carrot cake! Springtime, here we come. Yum! Your baked goods always look so delicious! Wow Jeanine! 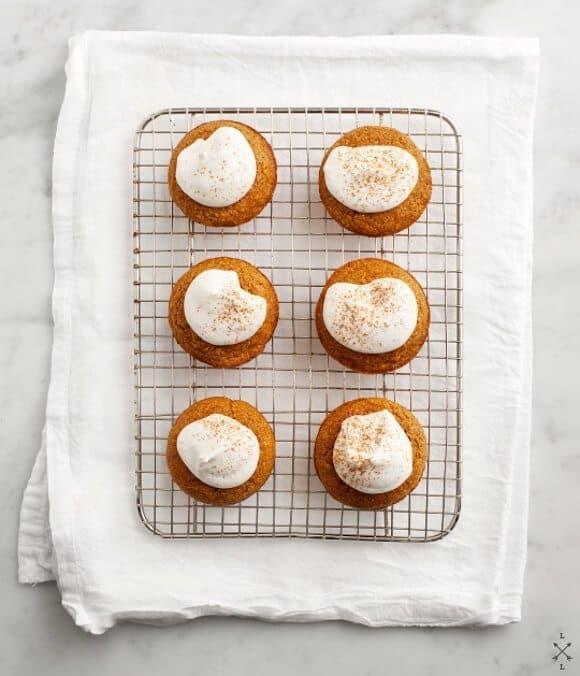 These carrot muffins look so inciting, and coconut whipped topping! Sounds perfect. I adore the overhead shot. The coconut whipped frosting looks fabulous plopped on top and I love how they each look slightly different. YUM. Carrot cake is my FAVORITE. I love that you used the coconut milk as the topping. I like a light whipped topping. This sounds perfect! These look lovely! And, I am terribly jealous of your springtime and non-stop carrots. We are in winter for another 2 months! Alas. Love your photos, as always. Made these muffins today but instead of cinnamon I substituted 1/2 tsp. of grated ginger and 1/2 tsp. of ground ginger. Left off the whipped topping this time as I made them for my work lunches. Next time. Tried one and they are delicious! I love this combination – Jeanine, and I love that those cupcakes are so petite and pretty. We get loads of carrots in our CSA, but I’ve yet to bake with them – guess we know what I’ll be doing this weekend! The coconut whip sounds amazing. 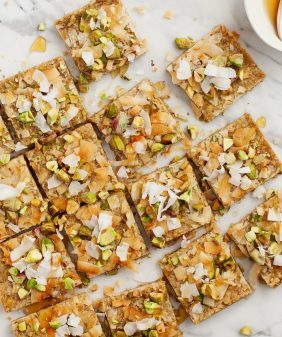 I love carrot cake – really want to try it with the coconut oil instead of dairy. At last! Someone with the insight to solve the prlmoeb! These are so cute! I love the coconut whip idea — I’ve seen this a few places lately and would love to try it out. So fun! Yes. This is exactly what I want to make with my 5-lb bag of carrots! 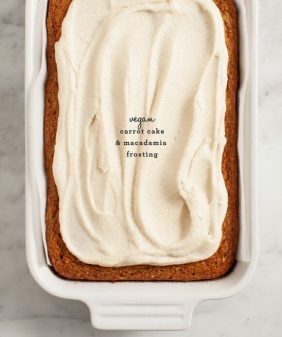 And I still have yet to make “whipped cream” from coconut cream, but I’m excited for this since I’ve never liked the heavy cream cheese frosting that normally goes with carrot cake. I hope you like it, it’s so light… and so easy to whip up in no time. Is it possible to substitute the egg in order to make this a ‘vegan’ friendly recipe? 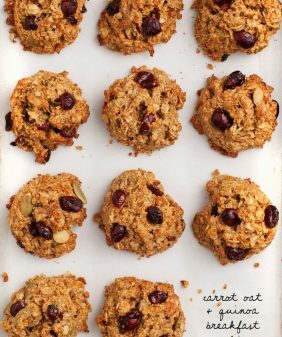 Hi Leona, do 1 tablespoon flax seed plus 3 tablespoons warm water (mix it in a little bowl first, until it gets gummy, then add it to the wet mix). Depending on what flour you use, they might fall apart a little more. (ie. if you’re using gluten free flours, they’ll be less cohesive). How long will the whipped coconut topping stay firm; can it sit out for an hour or so or travel in a bowl to be used once the food arrives & is set out? Hi Marti, I’m not exactly sure, it’s pretty light and airy – I’d try to keep it refrigerated and use it as quickly as possible. (Next time I make it I’ll give it a leaving-out/traveling test). So glad you liked these, thanks!! I did only the whip for the moment and it is delicious! But i was wondering what do you do with the coconut liquid? And is it oil or water? Thank you! It’s mostly water (coconut flavored)… the easiest thing is to save it for smoothies, I sometimes incorporate it into coconut soups (with another full can). I made these muffins a few days ago and WOW. They are spectacular. These are seriously the most delicious carrot cake muffins (or any form of carrot cake) I’ve ever had. Thanks so much for the recipe! you’re welcome, I’m so glad you liked them! Great recipe! Very moist and tastes great without the whipped cream on top. Thank you! 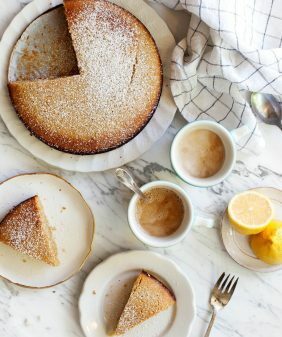 Does coconut flour work in this recipe? I just bought a 4 lb bag! Hi, these look great, but are not gluten-free. Spelt has gluten.